Have faith that it will all work out in the end. A few weeks ago, we visited a church for Sunday service. The priest was a fine public speaker, mixing anecdotes with antidotes as she spread the wisdom of the Gospel throughout the congregation. It was the kind of sermon that I grew up listening to throughout my youth. There was a story with a candy-coated life message inside, and you went away feeling inspired and enlightened. But at the end of the day, all I could remember was her saying the phrase “there is no hope.” I can’t even remember how it played into the sermon, but it stuck in my head. Maybe it was my mood or the struggles I’ve had finding full-time employment, but there it was, caught in my thoughts. Many is the day that I look at my job search and ponder those very words, “There is no hope.” I have the grace of God and the love of a great family supporting me, but after more than a year of frustrated job hunting one can’t help but wonder where hope has gone. 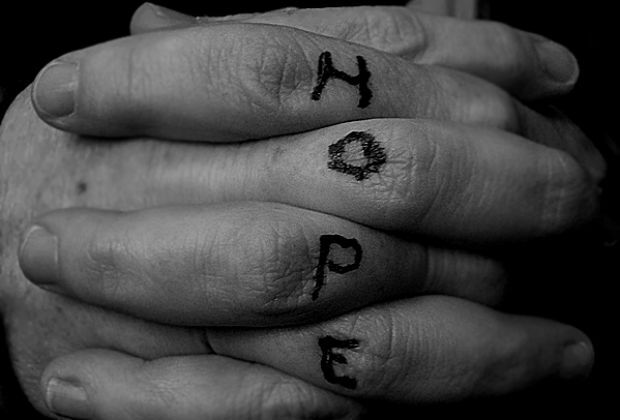 Now the Bible is big on faith and hope and love and charity, but for some reason “there is no hope” stuck in my head. Crazy, right? My belief is that in your heart of hearts you have to keep telling yourself there is hope. I find as I get older the inspirational words of others aren’t just platitudes on posters or clever writing on plaques at the mall. They help me gather strength as I go about my day. We all need to remind ourselves that when you’re tired or fatigued, giving up is easy, as Prefontaine so aptly noted. When you look over and see how easily some people seem to slip from job to job, while you toil at application after application, it can tire you out; fatigue shakes your confidence at its core. I say bunk. There is hope. Don’t give in to fatigue. It’s a simple rule, really. You just can’t let your too’s get out of balance. Simply put, never make a decision when you’re too tired, too hungry, too sleepy, too stressed or too anything that might cloud your thinking. If your too’s are way out of balance, you’ll make poor decisions. It’s as simple as that. So when you start feeling like the self-doubt gremlins are winning the war of fatigue, check your too’s and make sure you don’t have something out of balance. Don’t let anyone convince you that there is no hope. Hope comes in many forms, and it just might be coming at you in a way you never expected. So be ready for the possibilities life sends your way. Look and listen for hope, it’s all around you. No truer words were ever spoken. Remember you write the story of how your story ends and not others. So if your life hasn’t worked out the way you wanted yet, keep hope alive and remember it’s not the end until you say it is. PS — If that doesn’t work, February is National Pet Dental Month, so go brush your dog’s teeth. That will pull you out of the funk, if nothing else will. For a little bit of inspiration, meet Sarah. When Sarah’s hours were cut she needed to figure out how to keep her one-income household afloat. ⇐ How America Works ™: Ben Franklin Meets Facebook at Good Time Stove Co.